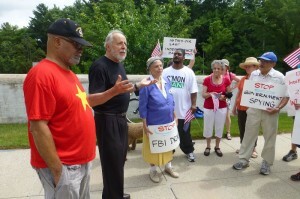 Home › Communities & Focus Areas › No FBI Use of Drones for Domestic Surveillance! No FBI Use of Drones for Domestic Surveillance! Westchester residents are concerned about the increasing monitoring of ordinary people by our government, and the corporations that work with the government to mine data collected from a wide range of electronic sources. This concern is intensified by the acknowledgement by the Federal Bureau of Investigation (FBI) that it is now using drone surveillance within the United States, opening the way for video recording of our everyday activities – who we meet, who we are friends with, where we work, where we shop – to be part of the government’s electronic dragnet. We support the ACLU and the NYCLU’s constitutional challenge to the surveillance program under which the National Security Agency vacuums up information about every phone call placed within, from, or to the United States. The lawsuit argues that the program violates the First Amendment rights of free speech and association as well as the right of privacy protected by the Fourth Amendment. The complaint also charges that the dragnet program exceeds the authority that Congress provided through the Patriot Act. This vigil was organized by KNOW Drones and supported by American Iranian Friendship Committee, Concerned Families of Westchester, Community Governance and Development Council, The Lower Hudson Valley Chapter of the NY Civil Liberties Union, Memorial United Methodist Church, Green Party members of Westchester County, WESPAC (list in formation).